Dr. Nathaniel B. Thomas, is currently the Pastor of Forestville New Redeemer Baptist Church in Forestville, MD and has served since 1993. Presently, he has been appointed to serve on the DC Mayor’s Commission for National and Community Services. Additionally, he is a Licensed Independent Clinical Social Worker (LICSW). He serves on the Executive Committee of the Baptist Minister’s Conference of DC & Vicinity and have served on the Board of Directors of Centre Point Counseling Services, Inc. He has been involved in community outreach for many years. He hails from the Johnson Memorial Baptist Church (formerly Burrell Memorial Baptist) where he was baptized by the founding Pastor, the Late Rev. Mitchell Johnson. He accepted the call to preach the Gospel and licensed July 22, 1979 under the pastorate of Rev. Rodney L. Young. Under the leadership of Rev. Dr. Joseph A. Gilmore, Sr., the Mt. Ephraim Baptist Church ordained him on November 28th 1992. He has been recognized by “Who’s Who of American Professionals” and “Presidential Who’s Who Among Business and Professional Achievers.” He is a member of the American Association of Christian Therapists (AACT), National Association of Social Workers (NASW), North American Association of Christian Social Workers (NACSW) and the National Association of Christian Counselors (NACC). He has served on the Advisory Board of Adventist Hospital, the National Cancer Society and the Howard University Hospital Community Development Advisory Board. 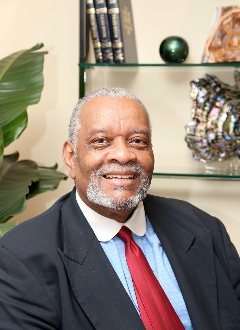 Dr. Thomas is an educator who served until his retirement in December 2005, working out of the Office of Student Affairs at Howard University. He worked with approximately a thousand students annually. He worked as an Educator, Counselor, Staff and Buildings Management. Additionally he was trained in doing Therapeutic work (focusing on Youth & Family). He has earned several honors and awards for his work with the youth population. In February 1990, he was elected president of the National Association of Student Affairs Professionals (NASAP) formally NAPW. This Association comprises student affairs professionals from most of the HBCU’s such as Vice Presidents, Vice Provosts, Counselors, Financial Aid Officers, and Deans to name a few. He was the recipient of the Sadie M. Yancey Award, which was the highest award given out of this Association. He has taught at various institutions, such as Calvary Christian College, the Baptist Christian Education Congress, and the PG Baptist Association Lay Leadership workshops and forums to name a few. He has been blessed with the gift of song. As a soloist, he has traveled extensively on tours throughout the United States. He has had a great opportunity to appear on programs with great artists such as Richard Smallwood, the Late Dr. Pearl Williams-Jones, the late Rev. Donald Veils, Rev. Shirley Caesar, Hollywood’s great Jester Hairston, William Warfield, Nathaniel Morris and others. Many of these opportunities were due to the mentorship of Professor John Westley Hunter, Allen University. Dr. Thomas holds a Bachelor of Science degree, two Masters (one in Social work with Therapeutic emphasis and the other in Theology) and a Doctorate in Divinity. In December 2008, he received a Diploma in Pastoral Ministry from the Baptist Theological Seminary of Zimbabwe by way of the Lott Carey Baptist Foreign Mission Convention’s Pastoral Excellence Program. This diploma was bestowed upon him after completing 3 years of preaching, teaching, counseling, theological reflections and perspectives in Guyana, South America, Jamaica, West Indies and South Africa. He received his degrees from Delaware State University, Howard University School of Social Work, Calvary Christian College and Honorary Doctorate of Humane Letters from Virginia University of Lynchburg. His on-going studies in Continued Education came by way of the National Institute of Health, the Maple Springs Bible College & Seminary, Duke University School of Divinity, George Mason University, and the University of San Diego. Prior to attending Delaware State he attended Allen University for three years. He served on the White House Southeast Regional Center for Drug Free Schools Advisory Board under the Department of Education. October 2012, he was a delegate for the Conference of Mayors in the country of Equatorial Guinea, West Africa addressing education & economic development. In 2014, he toured and was guest in the Republic of the Congo and the Democratic Republic of the Congo with Rev. Johnathan Weaver and Attorney Midget Parker. Dr. Thomas is married to the former Diane Willis, with three children, Matthew, Natali and Dana. They are also blessed with five Grandchildren, Kristen, Eryn, Matthew Joshua, and Jamari.